Power of Laser Effectively Removes Spots, Freckles, Birthmarks & Tattoos. Melanin is what gives our skin its color. The amount of melanin in your skin determines if you have a light or dark complexion. Pigmented lesions are dark in color simply because the melanin is abnormally concentrated in one area of the skin. High concentrations of melanin can be due to various factors. Some types are present at birth, but most occur with age, or as a result of overexposure to the sun’s damaging ultraviolet rays. Just about everyone have a few obvious brown spots on their skin. Age spots, freckles, and various birthmarks are just a few of the commonly known marks generally referred to as pigmented lesions. Although some pigmented lesions can be ignored, many are quite conspicuous, and can easily detract from your skin’s natural beauty. The MedLite laser can remove professional, amateur (homemade), traumatic and surgical tattoos. The advent of Q-Switched lasers has permitted the removal of most tattoo inks with a very low risk of scarring. The MedLite Q-Switched Nd: YAG laser is the laser of choice in this class of laser. The MedLite can signiﬁcantly lighten or remove a wide variety of tattoo inks. Epidermal & Dermal Pigmented Lesions is perfect for treating a wide variety of epidermal and dermal pigmented lesions on all skin types, including age spots, solar lentigines, café-au-lait lesions and dermal melanycytosis (Nevus of Ota, aberrant Mongolian Spot). Most lesions can be removed quickly with little to no risk of hypopigmentation results. The MedLite is most commonly used for removing brown age spots, “liver spots”, freckles and other brown birthmarks, such as cafe-au-lait spots and Nevus of Ota. Your physician will identify your speciﬁc type of lesion and discuss the removal success rate associated with your condition. The laser light of the MedLite is speciﬁcally designed to effectively target the dark concentrations of melanin. After the abnormal amounts of melanin are removed, and treatment continues on normal skin, some whitening could occur. However, your body’s natural regenerative system would replace the normal melanin over a period of time, returning the skin to its natural color. The MedLite laser emits light in very short pulses. The impact of the energy from the power pulse of light is similar to the snap of a thin rubber band. After the treatment, the area will feel similar to light sunburn. Typically any discomfort will disappear within a day or so. After the redness clears, the skin returns to its natural color and texture. MedLite laser removes tattoo ink with the energy of light. A laser is a device which is designed to produce one or more specific wavelengths of light. Tattoo ink is removed by using this specific wavelength of light which passes into the skin, but is absorbed by the ink. The rapid absorption of light energy causes the tattoo ink to break into tiny particles which can then be removed by the body’s natural filtering systems. 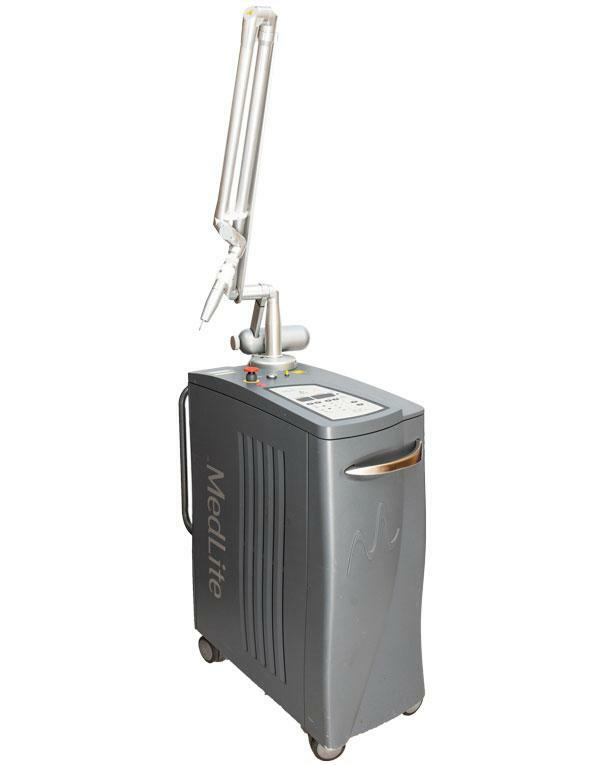 The MedLite laser provides maximum tattoo removal while leaving the surrounding skin unharmed. The majority of patients do not require anesthesia, depending on the size and location of the tattoo. Anesthesia creams are available if needed.